COVER: Beginning Backgammon is a new and pleasurable method of learning this mewly popular ancient game by playing against a master Tim Hollandwho has won the World's Championship of Backgammon three consecutive times and the International Championship of Backgammon twice. Play the five games in this book, move by move, and you will be well on the road to playing a good game of backgammona game you will improve and refine each time you play. Tim Holland is a marvelous teacher; he understands that a novice must enjoy a game to learn it well, and he has incorporated this principle into his book. 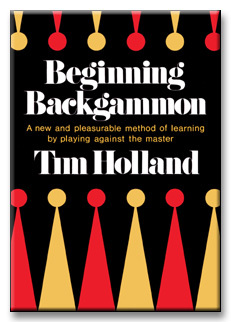 Beginning Backgammon won't turn a beginner into an instant champion, but Tim Holland does guarantee to start you right, learning by playing. World's Champion Holland is your opponent in each of the five games in Beginning Backgammon, which is illustrated each step of the way. Beginning Backgammon includes the rules of the game and a glossary of backgammon terms. AUTHOR: Tim Holland is widely hailed as the world's leading player of backgammon. For three consecutive years he won the World's Championship of Backgammon, a tournament that has been held in Las Vegas annually since 1967. Mr. Holland, who holds more major titles than any other backgammon player, has also twice won the International Championship of Backgammon, held each year in London. Mr. Holland is noted for his aggressive and imaginative style of play. He lives in New York City.